Zoom Zoom that you should remove, because it is first of all annoying, and second of all dangerous as it might pave the way for more dangerous infection to arrive on your desktop. The program has been created with the intention of nagging you with commercial advertisements. However, the ads may prove to be more than just annoying. Our analysts have found that Zoom Zoom could be used by scammers and cyber criminals to infect your Computer with malware such as ransomware or fake antimalware scanners. In addition to that, it may gather personally identifiable information about you. So let’s get to more detailed information about this adware that should encourage you to remove it. 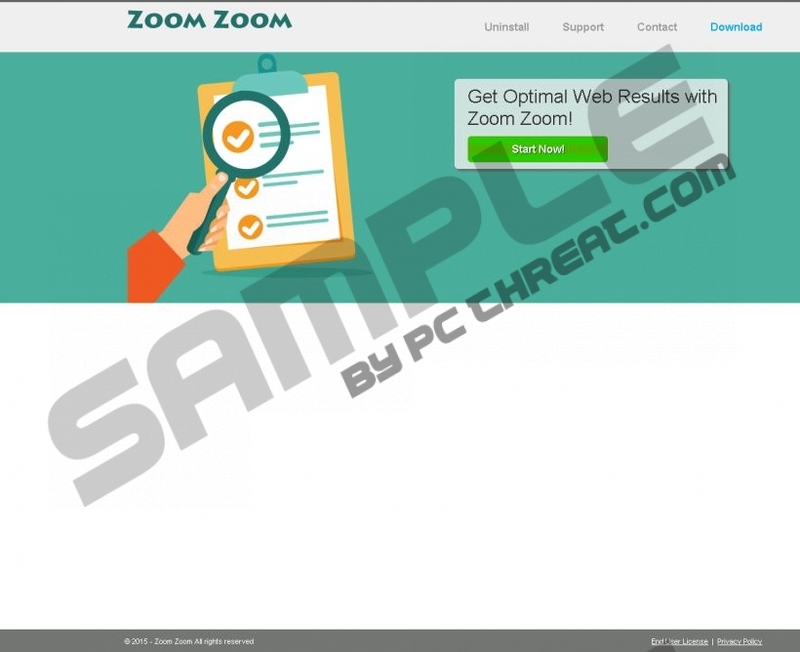 Zoom Zoom is a product of the SuperWeb LLC., which specializes in developing adware applications dedicated to making money for the company. It must be noted that recently SuperWeb has been very active as it has released several new adware applications. Among the newest additions the SuperWeb adware family apart from Zoom Zoom are Special Box, SquareTrace, and Wild West. At any rate, all of the aforementioned programs are merely clones of each other that users should also remove. All SuperWeb adware apps have their own dedicated websites. In this case Zoom Zoom’s website is called Zoomzoomapp.com, which looks pretty much identical to the websites of its clones. The websites share another common feature, which is that the programs themselves cannot be downloaded from their dedicated websites. Alternatively, you might get infected with Zoom Zoom by installing freeware bundles from freeware distributing websites. So remember to always opt for custom installation when installing them and remove Zoom Zoom from the installation process. As mentioned, Zoom Zoom displays commercial advertisements that come as coupons, pop-ups, in-text ads, banners, and so on. The ads are unreliable to say the least, as they can be the source of infection that could compromise security by installing ransomware or fake software. Additionally, the adware could collect certain information about you. It might keep tabs on what pages you visit, what you search for, and so on. This information then could be sent back to the developers for analysis and to adjust advertising tactics. As you can see, Zoom Zoom is more than just a simple adware app. The content that it promotes may come from any third party that could aim to infect you with malicious applications. Its developers are likely to collect information about your browsing habits, which is wrong to say the least. So do not hesitate and remove Zoom Zoom as soon as you can. Find Zoom Zoom and click Uninstall. Quick & tested solution for Zoom Zoom removal.